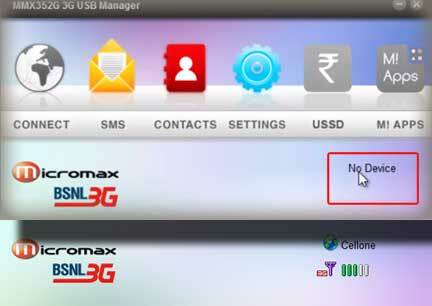 Micromax Dongle is a good wireless modem works for all network providers. It is plug and play USB device with a copy of driver stored within its drive. It is easy to install driver and connection in system. Dongle modem may not work if settings are not configured as per network provider SIM card. Dongle software control panel is easy to understand and normally it takes its settings automatically as per the SIM service. 1. Installation of driver software: first check its driver is properly installed into system and device is getting detected by the software. For this, connect the dongle to USB and go to the device manager. See there for any unknown device appearing after dongle connection. If so re-install the driver software. 2. Connect the dongle into USB and start its software. 3. Check network display: Check for SIM detection and available network is displaying on software panel. If showing “No Device” then driver may not install properly (go to step 1). 4. Check APN setting in Connection Profile. 5. Check “Network Mode” - Select "HSPA/UMTS" if you sure about 3G network in your area otherwise better to select "Auto". Rest all parameter leave in default condition.